The diet of modern man has become so perverted and unhealthy that most of us no longer recognize what is really true or natural food. The cold and city life have greatly modified the way we live and EAT. Before the Great Flood(s), there was an even temperature(mid 70's Fareheight) throughout the planet, and man was basicallty a FRUITARIAN. After the canopy was destroyed or damaged some twelve to thirteen thousand years ago and the climate went all out of whack, and humanity's nature changed(for the worse) to adapt to the unbalanced conditions. There was now desert and ice and snow, periods of darkness(night), and the Earth's field became much weaker, causing lower vitality, a shortened lifespan, and a lower level of conciousness, which in turn subjected us to basesr impulses and appetites. Even man's height and looks decreased, and the conditions just got worse with time, so that now -some 12 thousand years later, we are at the bottom of the barrel. The human Flood survivors had to make due with the new conditions, and the generally inhospitable environment necessitated the development of fire and agriculture and technology, which would make our lives more bearable -especally in the extreme north and south climate zones. The "gods" would help us in this respect, but their aid had a heavy price tag(enslavement), and after many riots and rebellions against them, the "gods" had enough of us, and established hybrid mediators or representatives who could more easily deal with us. The gods themselves hid in caves or mountains or went underground or out into space, from where they have secretly or indirectly manipulated us ever since. Their representatives or intercessors(whom we know as kings, princes, leaders, etc) were instructed to teach us everything we know from warring and hunting to farming and governing, to building our cities and homes, and developing our educational and religious systems. They of course also exposed us to their culinary and sexual delights to which we have become hopelessly addicted to. It was found that by cooking or heating certain foods it would bring out their flavour and make them more edible -such as vegetables and grains which are normally inedible, but it would also make them more addictive and injurious to our health. Cooked meat, of course became the great rage of the post-Flood diet, along with the fermentation of grapes(wine). In adopting this perverted diet of the gods, man became as one of them and the long descent into degeneration and destruction began. What you eat has a decided effect on all levels of your being, and the more stimulating or intoxicating your food, the more degenerated and animalistic you become. All of the wars and diseases of history are stimulated by the wrong diet, and most of the evil, violent, or perverted rulers of history loved their meats and dairies and fermented beverages. Even vegetables, which require human assistance to grow, have a narcotic effect on the body and mind. So what is the ideal or natural food of man? Basically, anything you have to cook, eat, or grow artificially(farming/agriculture), is not natural. Natural food grows on its own -without the assistance or tampering of man, and is cooked or ripened by the Sun itself which is the ultimate life or food giver. This leaves us with fruits and nuts, both of which grow on trees. Anything that grows on trees is the natural God-given food for man. The gorilla, which is the closest animal resembling humans, subsists almost entirely on tree food. Even the other animals(who have become as addicted to the wrong foods as man has) can subsist off the food of trees. Fruits are light and varied and delicious and fall to the ground where their seeds germinate into more trees. Nuts provide a more solid kind of protein food which balances the lightness of the fruits and gives our teeth and jaws something to exercise on. Trees not only give us shade, shelter, and oxygen and keep the ground sturdy and moist, but they also give us food -the best and only kind there really is. Fruit is colorful and fragrant can easily be picked with one's hands. Every other "food" cannot compare and is actually poisonous or injurious to us -and this includes most vegetables which are actually the "devil's" food or creation(they look very "Halloweenish"). In Hereward Carrington's "The Natural Food of Man" he discusses sound reasons both scientifically and spiritually why fruits and nuts are the ideal(and only) real food of man. Not only were we built physiologically to eat such a diet, but the results speak for themselves. After some months on this diet, the nature becomes much more calm or non-aggressive, the passions abate, the sensitivities increase, and the intellect or clarity of the mind soars. Physical strength and endurance increase and most diseases and irritations greatly decrease or vanish altogether. Aging is slowed down, looks improve, and the attitude is decidedly more positive and confident. On an environmental level, very little garbage is produced(most of which can be composted), there is no need for cooking or preparation or utensils, and no need for destructive farming, killing, or wasteful packaging. Everyone becomes healthy and happy and the planet remains clean and whole. This sounds too easy and good to be true, and in a way it is because most of humanity is terribly addicted to its current processed diet, and the food companies will go to any length to keep it that way -in the name of money and profit. Food and addiction to it is the biggest business of all, and will not go away easily. Humanity is a drugged or addicted race, and so are all his other fellow creatures. Education and awareness are the first steps and keys in overcoming this drugged state, and the internet is helping with this. Even being aware that you are addicted to an unnatural and destructive diet may not be enough. Often, help from others is required to help you overcome it. Also, our climate and environment need to change drastically, and the evil ones who manipulate it must be removed. Rehabilitating humanity to its proper and original diet will probably be the single largest and most important undertaking of the future -but it must and will be done. Even on a fruit and nut diet one must be careful. Today's fruit is not what it used to be. Most fruits today are overchemicalized or hybridized so that you are not getting the full or desired benefits. Before 1950, this was not such a big problem, but then came overpopulation, the big move to the cities, and the use of pesticides and chemical fertilizers. Cities are cancer sores on the face of the Earth and are not conductive to healthful living, and this is compounded by the cold and unbalanced climate. Food must be transported and preserved and is largely why our food is chemicalized and unhealthy. Food should be eaten fresh from its source and in season which means going back to a rural way of life and growing it ourselves. Also, most of us should not be living in the cold zones where we cannot grow our food year-round and must rely on its importation. Also, unfortunately, our planet is still in much disrepair, and only when its canopy is restored, and an equable climate re-established throughout, will everyone be able to enjoy a fully natural and healthful diet. Planting a tree is not difficult and in most cases nature does this on its own, but it takes time for that tree to grow, and today's clearing and deforestation practices for housing and industrial growth are truly criminal. Fires are even set intentionally for such schemes. There are clearly evil or selfish forces on this planet which have little or no regard for health and human or animal life. If everyone would eat only what grows on trees there would be no need to butcher animals or toil the land in sweat. Both of these activities are abominable and unnatural and cause much pain, pollution, destruction, and disease. Animals are our friends and not our food and should be free to roam wild and do their own thing. Cows should not be milked and chicken eggs should not be eaten and honey should be left alone for the bees themselves. Grains, and most legumes and vegetables are all grass-derived foods which have been cultivated or developed by the hands of man and are therefore unnatural and unhealthful for our consumption. They would all die away and dissapear without human assistance or intervention. 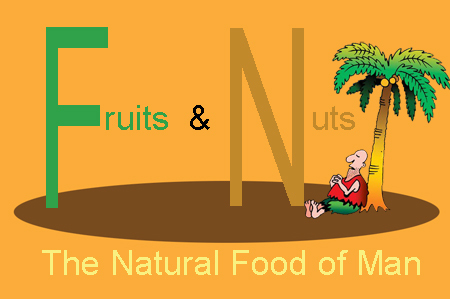 Fruits(and nuts), on the other hand are self-seeding and regenerating and are the original or intended food of man. There are two creations on this planet living side-by-side; the white or divine creation and the black or satanic creation. All foods and animals friendly to man were designed and created by the good angels for our pleasure and enjoyment. The good creation includes humans, mammals, and most birds or fishes, as well as fruit and nut trees and most beautiful and non-poisonous plants and flowers. The dark or counterfeit creation by the fallen angels includes the reptiles, crustaceans, insects, fleas, parasites, etc. -all of which are bothersome or at emnity with man. There is a reason why most of us hate spiders or snakes or mosquitoes -namely because they are of the dark creation. Of course there are exceptions in every group but the general rule applies. Some fishes like sharks or poisonous jellyfish are not friendly to us, while dolphins and whales are. The amphibians(frogs, toads, salamanders, etc. are not that bad, even though they are closer to their reptillian brethren. Poisonous trees, plants, or fruits are of course dark creations. Hybrid and especially GMO(genetically modified organisms) foods are bad for you and should be avoided whenever possible. They can usually be recognized by their seedless and oversweet nature, are usually larger, unnaturally shaped, and more easily subject to spoilage. Worst of all, they damage your health and pervert your appetite. The best fruits have the largest and darkest seeds, like cherries, avocadoes, prunes, and peaches. The worst ones have very tiny, transparent, or no seeds at all. Most grapes, bananas, papayas, oranges, and watermelons sold today are hybrids or GMO's and the trend is for ALL fruits to be so thanks to companies like Monsanto and Dupont who want to regulate or control the food industry and keep us dumbed-down and enslaved to them. Then there is the organic versus non-organic issue which can make a huge difference in the quality of your produce. Basically, organic fruit or produce is grown without chemicals or pesticides and has a much higher nutrient value than conventionally grown foods -but they are also more expensive. Organic produce labels begin with a 9 wheareas conventional food labels begin with a 3 or 4. GMO food labels begin with an 8. The problem here is that not all labelling practices are honest or sound so one has to exercise one's own judgement as to whether the food he or she is buying is truly organic and to what degree. Your best bet is to visit the local farm and talk to your farmer, or better yet -grow your own food with certifiable seeds. What a sorry state our world has come to, particularly when dealing with food. In most of the modern industrialized world it has become as polluted and unhealthy as the environment we live in. It seems humans, as hard as they try, cannot improve on nature as it was originally designed, or there is a conspiracy to make it worse. It is true that basically ALL food is bad for us and and that it is just a question of which foods are the LEAST bad. Fruits and nuts(and berries and seeds) are the least bad or addictive of foods. Our bodies don't even require solid food. The human body is self-sustaining and repairing and the less we tamper with it(by introducing "food" into it) the better. It is not our bodies that hunger but our souls or spirits. The body can derive everything it needs from its environment provided that environment is a natural one. All it really needs is light or sun food -like the plants, and enough moisture(which it absorbs through the pores of the skin). This light, radiation, or sun food is distributed to all parts of the body via the air we breathe and the moisture we absorb and is what builds our blood, bone, and tissue. The air itself is then expelled as waste, and excess moisture or water is urinated. Your body is an electrical system tied in to the electrical grid around you. The electric, etheric, auric, or second body of man is what sustains and repairs the physical one. Getting enough solar food or current to all parts of you is what health is all about, but food can impede the natural flow of this resulting in sickness and disease and death. Hunger is basically a disease. It's telling you that you are sick or unfulfilled in some way, and this can be mental, emotional, or spiritual. We try to substitute our unfulfilled needs through eating or food but the effect is temporary and has grave side effects. Love and truth are the answer to hunger and death but we live in a world where the opposite qualities seems to reign. Contary to what science tells us, humanity is living in one of the darkest and most ignorant times in its history. Only in the last few decades does there seem to be an important window of opportunity to see the light, in large part to the free and universal exchange of ideas over the internet, which is breaking the divisions imposed on us by our leaders, and reuniting us again. Everyone wants to live in peace and unity but certain forces seem to be preventing this. Those forces are now being challenged and an opportunity exists to take back our own power and make this a better world, but protest and rebellion are not enough. We need answers to some of our most fundamental questions, like what causes real peace and prosperity and how can we truly be healthy and happy. One of those keys is diet. We need to educate ourselves on food and then make those changes. We need to continue to share our ideas and truths about health and not rely on our misguided and deceptive institutions anymore. The vegetarian, vegan and raw food movements are all positive steps in the right direction. Most people will not be able to a adopt a fruit and nut diet right away so these are all good transition diets to undertake. And yes, it will take time. It takes months, years, or even decades for most to change from a highly processed to an all-natural diet. Although some can do the 21-day transition diets, this is not recommended, as your body often needs much more time to adjust, and besides -you don't really learn much in such a short time. The biggest hurdle you will face in adopting a natural diet(besides people's ignorant objections) is overcoming the chemicals in your food, such as processed sugar and salt, which are in almost everything we eat and which are two of the most prevalent and addictive drugs on the planet. There are other chemicles but once you've overcome these two you are on the way to recovery. You are best avoiding all processed or packaged foods which means almost nothing in cans, plastics, jars, or boxes. It goes without saying that candies, sodas, processed fruit juices, smoking, drugs, and alcohol should also be avoided, and you will note that as you make your basic food changes there will be less craving or demand for these. Occasionally, as you make the switch, you will feel a powerful need or compulsion to return to a certain food or even your entire old diet pattern. Heed this compulsion. For reasons not always apparent to you, there is a usually a good reason for this. Either you are going too fast or there is still something you must learn. Backtracking is not a sin and you shouldn't feel guilty if you do so. It's a common or normal part of the transition process and teaches you about the addiction process or how food is heavily attached to certain emotional or social issues(mostly negative) that need to be resolved. When the clearing is done or you realize the physical pain and damage they cause you will no longer go back to those foods. This takes time and can even be a life-long process depending on your personal situation. Cut down on meat but do it slowly. Eart fish istead of beefd or lamb. Avoid pork altogether. Most people don't realize how much pain and suffering and disease they are causing because of meat-eating. They just think of the taste or the stimulation it gives them.. Most people would stop eating meat if they had to go out and hunt for it and then prepare it themselves. Also, meat today is definitely not what it used to be before 1950. All kinds of chemicals and hormones are injected into livestock to speed up their maturity and make them taste better. It is these chemicals, more than the meat itself, that threaten your health. Also, most parasites come from meat. Personally, meat-eating makes us violent, sexual, and aggressive and causes bad body odor. Nuts are a good substitute for meat. They are hign in protein and satisfy the hunger. Nuts should be eaten raw and shelled. Next to be eliminated are dairy products which are animal-derived. Cow's milk is for calves, not humans -whether it be pasteurized or raw. Milk actually weakens rather than strengthens the bones and turns into a glue in the body. Cheeses and butters, which come from milk, only clog up your system and harden your arteries. Most diseases and parasites come from meat and dairy foods. Dairy also causes a lot of skin issues and ear and eye infections. After meat(including fish or seafood) and dairy, grains are next to go. Most grains and flour products, even the whole kinds, should slowly be eliminated. This includes breads, pastries, cookies, pasta, etc. Grain foods cause joint stiffening or arthritis, and are water retentive causing weight problems. If you must eat grains, quinoa and millet are your best choices. Occasaionally eating the better grains in combination with fruits is fine and can make a delicious and satisfying meal. Most vegetables are inedible unless steamed or cooked and are next on your elimination list. Tomatoes, cucumbers, and lettuce are not so bad, nor are steamed broccoli or cauliflower, but these serve best as transition foods and must eventually go as well. Onions and garlic serve more as medicine or antiseptics than food. The same with legumes(peas, beans, lentils, etc.) which have been cultivated into being from grasses. Chickpeas and peanuts(which are often thought of as nuts) are the best l egumes. Peanuts should be eaten shelled and preferably unroasted and in moderation. Roasting brings out the flavour but also makes it addictive and more difficult to digest. What about greens? Some people may require them, others not. Personally, I am not attracted to them and find them to be bland, vibration-lowering, and difficult to digest. They may be necessary, however, as a transition food. Some of the best greens are kale, spinach, and lettuce. Lettuce makes an especially good salad, and nuts and greens mix well together. Note: This list is not complete and not all of the classifications are universally agreed upon. What we are left with is fruits, nuts, berries and seeds -which are the true and natural foods for both humans and animals(at least those on our side). This diet greatly improves the health and mind and elevates us to our true stature on Earth. In terms of ratio, fruits(and berries) should consist the main diet with nuts(and seeds) being supplementary. While they can be mixed, this may not agree with everyone, so the two groups are best eaten separately. Also, it is best to eat the fruits first and then the nuts minimizing any acidic reaction. Fruits in the morning and nuts in the afternoon or evening is great, but you will eventually develop your own schedule or system. Fruits should be washed and peeled if waxed and are best left out in room temperature exposed to the light and sun. While you can mix your fruits it is best to eat them one variety at a time. Smoothies are fine, especially for those who have trouble masticating, but simply eating them as they are is best and nature's way. For those making the transition, you will find that fruits, which are less dense or caloric, may not satisfy, and craving issues(for your old foods) will surface. Eating nuts and seeds and fatty fruits like avocados will help here, as well as eating enough fruit till your full. Eventually the cravings will die out and you can then eat less amounts of fruit and be satisfied. Also you may lose a lot of weight in the first few months to a year, especially if you need to heal in some way. Once the problem is solved you will put back some of the weight, but fruitarians in general are light and slender so don't let the weight issue bother you so much. The important thing is that you feel better both physically and in every other way. The fruitarian is one of the healthiest and happiest beings you can know, free of fear, worry, misery, depression, anxiety, disease, degeneration, and decadence. In the new Heaven and Earth, where our climate and environment are also restored, the fruitarian diet will be the standard diet, and if you think you can still cook your meat and enter God's kingdom or Paradise you are sadly mistaken or deluded, so start changing your ways now and be ready.